Demonstrator at the Texas State Capitol, Austin, Texas, July 1, 2013. Photos by Deborah Kirksey Coley / The Rag Blog. A political party that actually loves liberty would not seek to deny it to any of our citizens, especially pregnant women who may be vulnerable and in need of compassion. Any reader of this column is undoubtedly aware of the actions last week of Texas State Senator Wendy Davis, who successfully filibustered the anti-abortion bill known as SB 5, filed in the first 2013 special session of the Texas Legislature called by Gov. Rick Perry. Gov. Perry has now called another special session to give the Legislature another chance to pass this anti-abortion legislation. 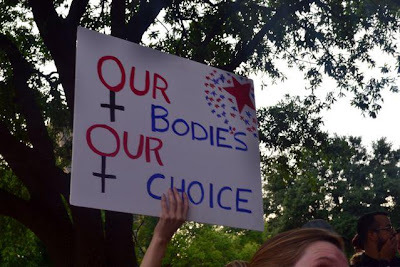 What Davis did was try to stop a bill that not only would deprive Texas women of their reproductive freedom without improving women’s health services, but was a clear violation of the Supreme Court’s 1973 decision in Roe. v. Wade. While there are many opinions about when and if a pregnancy should be terminated, I won’t dwell on that debate because a woman’s right to an abortion is settled constitutional law. The Supreme Court held 40 years ago that a woman’s right to privacy, guaranteed by the Due Process clause of the 14th Amendment, allows her to decide when and if to terminate a pregnancy. The court established a trimester framework for state regulation of abortion that was not based on the best medical knowledge at the time, and has been widely criticized by both proponents and opponents of abortion. Clearly, though, under our constitution, a state cannot completely deny a woman the right to terminate a pregnancy. But under Roe v. Wade and its successor cases, states have a legitimate interest in protecting a woman’s health when she undergoes medical procedures, and states have an interest in protecting the potentiality of human life depending on how far along the fetal development is. These two matters have been the focus of most abortion rights battles over these past four decades. Under the trimester approach of the court, a state’s regulatory authority over abortions is restricted. During the first trimester (approximately 13 weeks), a state cannot regulate abortion. During the second trimester (weeks 14 through 26), a state may focus on its concerns for the health of a pregnant woman by regulating abortion procedures that can reasonably affect the woman’s health. During the third trimester, a state may regulate or prohibit abortion except when it is necessary to protect the life or health of a pregnant woman. In SB 5, abortion opponents decided to focus their anti-abortion efforts on trying to severely reduce the number of clinics where women can seek an abortion by requiring such facilities to be upgraded by adding expensive services and equipment that do not appear justified by any concern for women’s health. The effect of these new requirements would reduce the number of available clinics, thus limiting abortion facilities to only the most populated metropolitan areas of Texas. In 2008, there were 67 abortion providers in Texas, and 92% of Texas counties had no abortion provider, according to the Guttmacher Institute. The number and distribution of abortion providers severely impedes access to abortions for one-third of Texas women. Now there are 47 abortion clinics in the entire state of 254 counties. A report from Media Matters concludes that the proposed law Rep. Davis filibustered would reduce abortion clinics in Texas to five. The old SB 5 and the new HB 2 require that a physician who performs an abortion or induces one with drugs must have “active admitting privileges at a hospital” that is no more than 30 miles from where the abortion or induction is performed. Further, the hospital must provide obstetrical or gynecological health care services that are not offered by all hospitals in Texas. Oddly, the legislation also requires that the patient be given a telephone number to contact health care personnel 24 hours a day after the procedure, and requires providing the name and telephone number for the hospital nearest to the home of the patient in case emergency care is needed after the abortion is performed. In my experience, providing contact information after a medical procedure or surgery is standard medical practice in Texas, though most physicians may assume that their patients know where the nearest emergency room can be found. The Texas Hospital Association states that the anti-abortion legislation does nothing to improve women's health because emergency room physicians would be the ones treating a woman who needs emergency care due to complications from an abortion. Emergency room physicians can contact the physician who performed the abortion by telephone, regardless of whether that physician has privileges at the hospital providing the emergency room treatment or how far away the physician may be. Some of the most severe restrictions on physicians in the legislation, which are contrary to practices approved by the Food and Drug Administration (FDA), concern the administration of “abortion-inducing drugs.” Those FDA-approved practices allow the administration of such drugs (namely, what is called the “Mifeprex regimen” and often referred to as RU-486) in a physician’s office or clinic. The legislation, however, allows the administration of the Mifeprex regimen only “at an abortion facility” licensed under the Texas Health & Safety Code. This interference in a physician’s normal practice of medicine and a woman’s right to seek the treatment is not justified by FDA regulations, nor by any concern for pain felt by a fetus since the drug regimen is approved only for use within 49 days (seven weeks) of conception. Abortion opponents claim that a fetus can feel pain at 20 weeks, which justifies further regulation of abortion at that point in a pregnancy, but not before then. The only purpose of this Mifeprex regimen provision is to interfere with the constitutional right of a woman to terminate a pregnancy within seven weeks of pregnancy -- a period well within Roe’s 13-week time frame during which states may not regulate the right to an abortion. And it prevents her from using the services of her primary care physician unless he or she works at an abortion clinic and has privileges at a nearby hospital that provides obstetrical or gynecological health services. Such a blatant violation of Roe. v. Wade is a sufficient reason, standing alone, to oppose the legislation. Republican claims that the anti-abortion legislation the party is pushing enhances women’s heath are dishonest and bogus. The way the Republican Party has been behaving, especially in Texas, demonstrates that (to paraphrase the words of George W. Bush) they hate American women for their freedoms. The GOP has become the domestic political equivalent of al-Qaeda when it comes to women’s health care and the right to terminate a pregnancy. The party of Lincoln constantly conspires to reduce the freedom and liberty interests of Texas women. It works with anti-abortion activists to terrorize Texas women who want to terminate their pregnancies, as well as the physicians who provide them health services. Rep. Wendy Davis’s valiant filibuster and the efforts of her supporters in the closing hours of Gov. 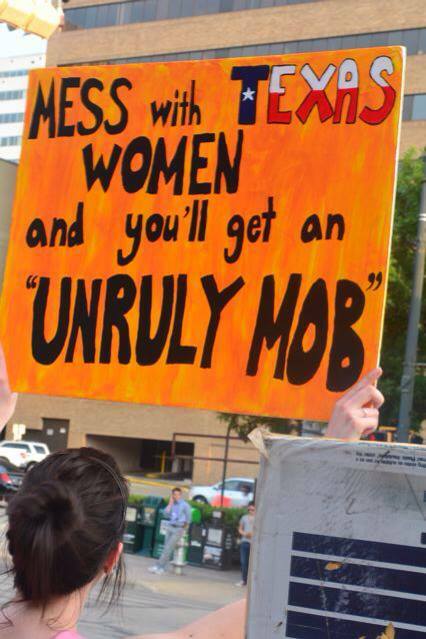 Perry’s first called special session of the Texas Legislature show that many women and men in Texas will not sit idly by while the tribe of Texas Republicans maneuver to take away the constitutional rights of women. A political party that actually loves liberty would not seek to deny it to any of our citizens, especially pregnant women who may be vulnerable and in need of compassion, understanding, and unfettered medical assistance.